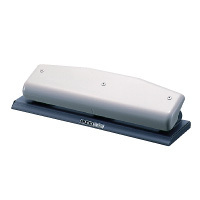 Light-duty two-hole paper punch. Punches up to 10 sheets. 6mm dia. hole, 80mm c. to c. with centering guide. Throat depth: 7mm. Packed in hanging translucent poly-package. Removable chip tray. Pastel Pink, Pastal Blue, Pastel Green, Red, Blue or Black. 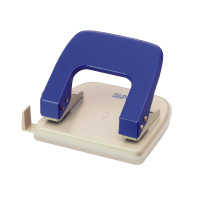 Light-duty two hole punch. Punches up to 10 sheets. With centering guide. Lock holds handle down when not in use. 6mm diameter. 7mm throat depth. Packed in poly-case. Blue. 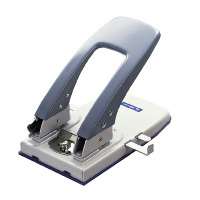 Medium-duty two hole punch. Punches up to 20 sheets. With centering guide. Lock holds handle down when not in use. 6mm diameter. 7mm throat depth. Packed in poly-case. Blue. 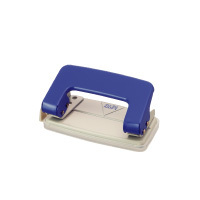 Medium-duty two-hole punch. Punches up to 20 sheets. Blue, Green, Wine-Red or Black. 5.5mm hole. 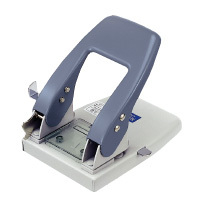 Medium-duty two-hole punch. Punches up to 24 sheets. Blue or Green. 6mm hole. 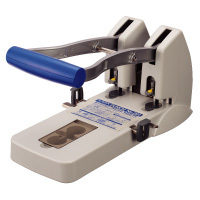 Heavy-duty two-hole punch with centering guide. Punches up to 50 sheets. Lock holds handle down when not in use. 6mm hole diameter. Grey. 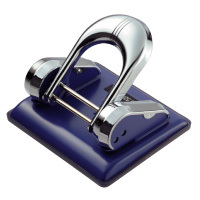 Heavy-duty two-hole punch. Punches up to 60 sheets. With centering guide. Lock holds down when not in use. 6mm hole diameter. Grey. 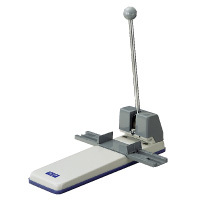 Heavy-duty paper punch. Punches up to 110 sheets. Light-weight, compact yet sturdy construction made from polycarbonate+glass-fiber. Cartridge-type punch head can be replaced easily and safely. Includes dual centering guide. Hole diameter: 6mm. Hole-to-hole distance: 80mm. Throat depth: 9mm. 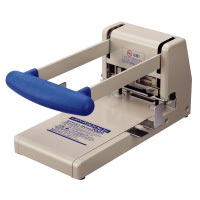 Heavy-duty paper punch. Punches up to 165 sheets. Light-weight, compact yet sturdy construction made from polycarbonate+glass-fiber. Cartridge-type punch head can be replaced easily and safely. Includes dual centering guide and spare parts storage box on the base. Hole diameter: 6mm. Hole-to-hole distance: 80mm. Throat depth: 9mm. 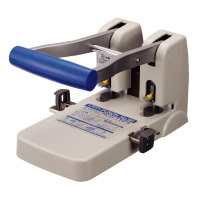 Heavy-duty paper punch. Punches up to 200 sheets. Light-weight, compact yet sturdy construction made from polycarbonate+glass-fiber. Cartridge-type punch head can be replaced easily and safely. Includes dual centering guide. Hole diameter: 6mm. Hole-to-hole distance: 80mm. Throat depth: 4mm or 9mm. 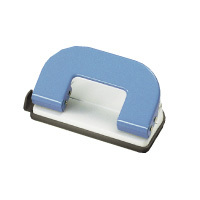 Extra-heavy-duty two-hole paper punch. With convenient centering guide. Punches up to 170 sheets. 6mm hole diameter. Grey. 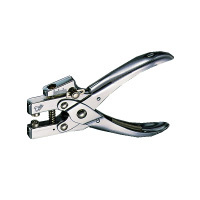 Standard 3-hole punch built to last. Punches up to 15 sheets. 108mm center to center. Removable chip tray. 7mm hole diameter. Grey. 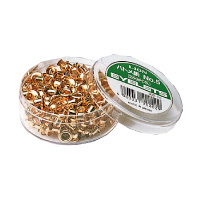 One-hole eyelet punch. 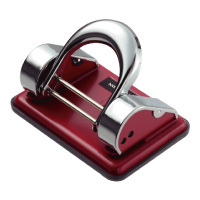 Nickel plated steel construction for strength and durability. Punches up to 20 sheets. 5mm hole diameter. Eyelets. Brass plated. 250 pcs. in plastic case.